I write this post at the end of my visit to Nigeria. How to describe it? Given that the country is vast and I travelled only to a few areas, my perspective is a narrow one. I met mainly with academics at Universities and Polytechnics in both the public and private sector. Also, I met with a few young people who established NGOs, dealing specifically with education. My visit focused in the areas of education and as a result I met, mainly, with people in that sector and therefore my perspective does not extend much beyond that. The first observation is the heat. Coming from Ireland, this is hard for me. My clothing is definitely not suitable to this climate as I packed mainly light business attire. The clothing that people wear in Nigeria – the traditional clothing – is very suited to this weather. Flowing robes are definitely preferable. A/C is available in most places so that helps me!! The second observation is the number of people. Living in the countryside in Ireland, I do not see so many people. And living close to a very small city I do not get a sense of crowding as one would in large cities like London. 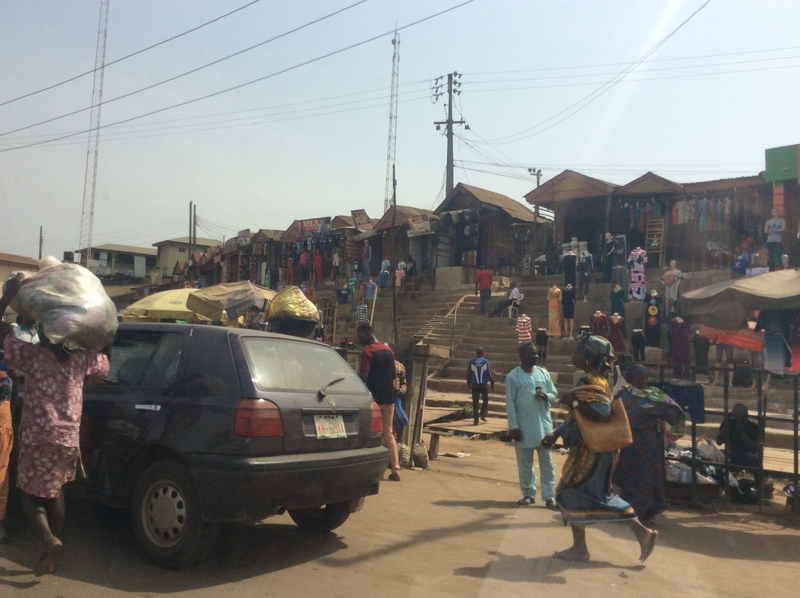 What I notice in Nigeria is that there are people everywhere, plus cars and motorbikes – lots of activity. I love the colourful clothing. Such a variety of fabric designs. Plus, people dress quite flamboyantly. I love it! I see women and men going about their daily activities in beautiful attire. 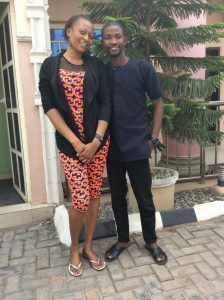 How they maintain looking so fresh, I do not know. Yet they do. For non-Nigerians, the driving is crazy. The roads are like a free for all – totally different to what I am familiar with in Europe or North America where I spent my life. Yet, there are few accidents. During my two-week stay, and travelling by road to several locations, I saw two accidents. Given the condition of the roads – and they can be really bad – this is amazing. One of the ‘funniest’ things that I notice is the number of people actually on the motorbikes. The driver of course, and then perhaps a child and a mother with a baby tied to her back. And none of them wear helmets!! I saw only a few helmets on motorbike drivers in Nigeria. And as I mentioned, very few accidents. Nigerians are good drivers! Travelling by road in Nigeria also elicits another observation. Many police checkpoints along the way. Not sure what they are looking for and why they stop cars, but they do that a lot. There are dozens of stops with several police or military at each stop. Coming from Ireland that is very strange. And being practical, I wonder at the cost of such redundancy. But, this is not my country! The density of little shops and buildings. All along the roads, in cities and towns there are shop fronts packed closely together and they are, usually, made out of wood with metal roofs. For me they look quite temporary and yet I am sure that they are not. 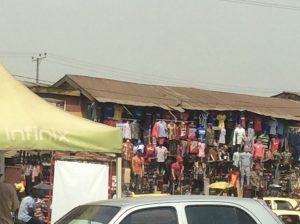 Little shopping areas or malls that we are familiar with are not quite the design here in Nigeria. There are a few and yet I would say that they are not the norm. There are many street vendors selling all sorts of items along the roads. What really stands out for me and what I will remember fondly is the friendliness of all of the people I met. From taxi drivers to hotel employees to restaurant servers and beyond. Because I am usually interested in people and extend a smile and a ‘hello’ when I meet people, I found that most responded in a welcoming manner, and generally, young people are still quite respectful of older (more mature?) people. A tradition in Nigeria that I found quite lovely is that younger people bow upon greeting. Another tradition is that young people will take your bag and hold it for you – bring it to the car or to your door. This happened to me quite a few times – it was strange and yet quite lovely. Also, for many of the places I visited they would not usually (or ever?) have visitors from outside of Nigeria or Africa. I was quite an unusual visitor. At heart though, the people here remind me so much of Dubliners from when I was young in Ireland. I think that is why, for me, it was such a deeply moving experience and one that I will treasure always. The most important aspects of my time in Nigeria pertain to meetings with academics at Universities and Polytechnics. I am impressed with the response received in Nigeria to our work. There is a consistent desire to enhance the already very good education system. Educational institutions in Nigeria graduate successful students. The focus in many of these educational institutions is to graduate students with tangible skills and those skills and competencies most suited to the emerging economy in Nigeria. CCN’s solution offers them a powerful tool to meet that goal and it is excellent to see the positive response to our solution. A special thank you to my two young escorts who made the trip safe and comfortable for me. I was most definitely in a very strange environment where I do not know the language nor the culture and I was a foreigner in a foreign land.